Purchase Order Financing is a funding option for businesses that need cash to fill customer orders before delivering a finished product. 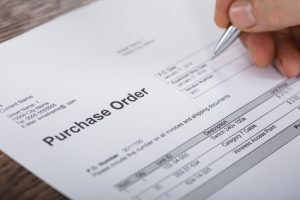 Commonly, Purchase Order Financing is used by importers & distributors who have pre-sold their goods, or they already have a Purchase Order (PO) for these goods from a customer. PO Financing is similar to invoice factoring, but it’s for companies who already have a PO in place. Purchase Order Financing helps the company fulfill the customer PO by paying the supplier who manufactures or sources the finished product. A Letter of Credit is often used to pay for goods coming from overseas and is a popular solution for importers, providing protection from the inherent risks of ordering internationally, while also giving suppliers assurance of payment for their shipments. Using this method, our client is able to deliver finished product to the customer and can factor the invoice for even greater cash advantages. Who Can Benefit from PO Financing? PO Financing allows a company to fulfill customer POs without using its own capital. This benefits start-ups or companies with seasonal sales or simply inconsistent cash flow. It also gives established companies the confidence to pursue larger sales. PO Financing answers the capital needs of companies who do not qualify for traditional lending solutions and business owners can keep their equity instead of giving up large shares to investors. Riviera Finance offers PO Financing to clients through our affiliate, International Trade Finance. Contact a business manager today to discuss your financing needs and get started today. This article was contributed by Jacquelyn Straub, a Business Development Manager at International Trade Finance.